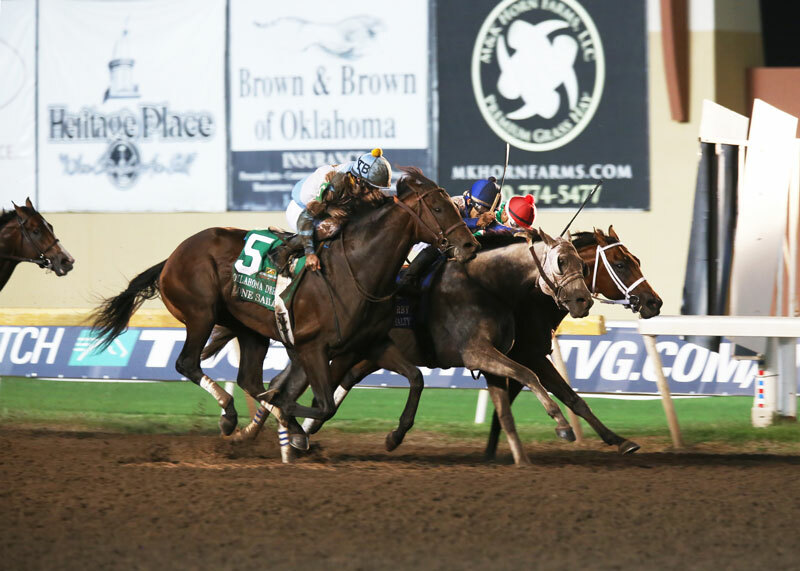 When the three top finishers hit the wire together in the Grade 3, $400,000 Oklahoma Derby at Remington Park on Sunday, you couldn’t have squeezed a couple of sheets of paper between their three noses it was so tight; not even the jockey of the winner, Lone Sailor, knew who won. In the end, Lone Sailor’s nose was longer than both Believe in Royalty and Diamond King, who ran second and third, respectively. Lone Sailor covered the mile and an eighth in 1:49.97 over a fast track. Then he took the Oklahoma Derby trophy and held it to his lips and acted like he was drinking in the elixir of success that he had just experienced by winning this race. The photo was so tight, it almost seemed like the three finishers were tethered together. Lone Sailor earned $240,000 for owners G M B Racing, of Metairie, La., an ownership that has been headed up by the family of the late New Orleans Saints owner Tom Benson, who passed away in March at 90 years of age. This 3-year-old colt by Majestic Warrior, out of the Mr. Greeley mare Ambitious, now has a lifetime bankroll of $873,237 from two wins in 14 starts, with five seconds and two thirds. Lone Sailor was bred in Kentucky by Alexander-Groves-Matz, LLC. Although Graham wasn’t sure at the finish, he had no doubts that Lone Sailor had a big chance to win. Lone Sailor paid $8.80 to win, $4.80 to place, $3.40 to show. Combined with 19-1 Believe in Royalty to pay $136.40 in the $2 exacta payout. Believe in Royalty paid $14.40 to place and $6.20 to show. Diamond King returned $6.20 on the show. The trifecta of 5-3-7 paid $225.25 on a 50-cent wager. The 10-cent superfecta was worth $250.36 with Combatant running fourth. On a day when the incredible blanket finish of the Oklahoma Derby still had the multitude of fans buzzing an hour later as they left, there was another incredible feat that happened. National Racing Hall of Fame trainer Steve Asmussen, currently the No. 1 conditioner in the country with horses’ earnings of more than $21 million this year, enjoyed a huge day with jockey Ricardo Santana, the nation’s ninth leading rider in money earned. The pair scored with five stakes winners of the 10 stakes events carded, a new record for stakes wins at Remington Park in a single day. A year ago, the Asmussen-Santana duo combined to win four stakes races on the Oklahoma Derby program. Even though Asmussen saddled four in the Oklahoma Derby this year, he couldn’t go back to back after winning the race for the first time in 2017 with Untrapped. Lone Sailor was just too much for his competitors – Combatant, Limation, Lionite and Retirement Fund. His best finisher was Combatant in fourth.